Sky and Telescope’s Hot Astronomy Product for 2008! 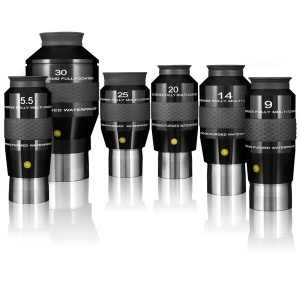 The Baader Planetarium Hyperion 68° Modular Eyepieces offer world-class performance and unique photo-visual features, at an unheard of price. Baader Planetarium has worked hard to give the Hyperions the world’s finest optical coatings, superb mechanics, and their unique multifunctional design. As a visual eyepiece, we have found the Hyperions deliver superb sharpness and color fidelity across their 68° wide, flat-field, even in fast telescopes. From their superb on-axis and off-axis sharpness, to their pitch-black high contrast field, the Hyperions really work. Viewing through a Hyperion is notably comfortable and relaxing, due to their forgiving eye-position, 20mm of eye-relief, extra-large eyelens, and an optical design that is free of annoying ‘kidney-beaning’ and blackouts. High grade water-white glasses are used throughout, to deliver a crystal clear view with low scatter and excellent color fidelity, free of the yellow or bluish coloration imparted by many other eyepieces. Use of high-index glasses delivers low distortion and astigmatism, even on scopes as fast as f/4. 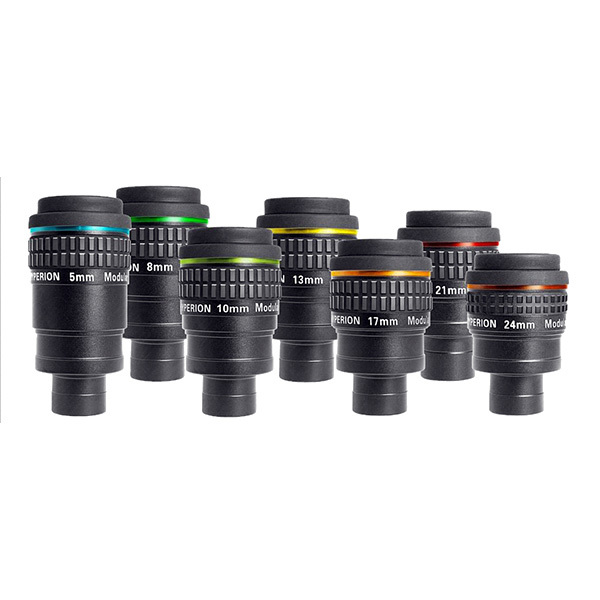 Works in both 1.25″ and 2″ focusers. 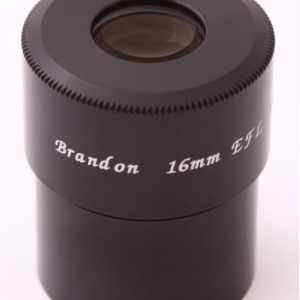 The 1.25″ barrel is threaded for filters and kept short (0.94″) to work well in binoviewers and spotting scopes. Baader’s new housing incorporates a full-length 2″ barrel (0.94″ long) and provides a specially designed tapered locking recess. In addition, the Hyperion field stop locations have been re-designed and optimized to give the shortest focus position possible (important for binoviewer use). Soft folding rubber eyecups work for both normal and eyeglass users. Each Hyperion comes with protective lens caps and leatherette storage pouch. All Hyperions Accept popular Astigmatism Correcting Lenses (not available from Alpine Astronomical). The Hyperion eyelens housing is compatible with the full range of correcting lenses from ¼ to 3½ Diopters. Observers with any astigmatism will really appreciate this feature, no longer needing to wear eyeglasses to see stars as true pinpoints. The long 20mm eye relief of the Hyperions works particularly well with these corrector lenses, without forcing the observer to press their eye close to the lens in order to see the entire wide field. Removable Negative Lens Element permits variable focal lengths using Baader’s New Finetuning Rings (see Accessories section). NOTE: The 24mm Hyperion is a different optical design and does not permit the use of Finetuning Rings to decrease focal length. Baader Hyperions incorporate some unique and innovative aspects, which are designed to make them the ideal projection eyepiece; The optical design of the Hyperions enables them to work as an extremely sharp wide-field projection eyepiece for even large chip CCD and DSLRs. The eyelens barrel has been provided with two different external threads, M43 and M54 (these are covered by the removable rubber eyecups). 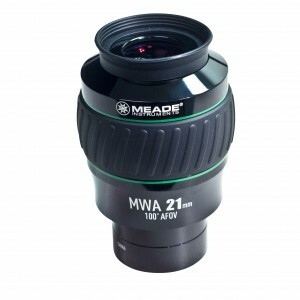 A complete system of adapter rings enables cameras to be directly (and rigidly) close-coupled for afocal projection, or variably extended for classical eyepiece projection imaging with our T-Adapter and Extension Tubes. A series of 16 threaded rings provides compatibility with just about every digital (CCD/DSLR) and videocamera made, even large and heavy 3-chip videocameras. For a complete listing of these adapters, please see HYPERION Digital T-Rings and Adapters. The front negative lens element is designed to be removed (and exposes an M48 2″ filter thread). This converts each Hyperion into a longer focal length high-quality projection eyepiece, giving the imager two choices of focal length with each eyepiece. NOTE: The 24mm Hyperion is a different optical design and does not contain a removable front element. However, the Front Barrel can still be removed in order to attach 2″ Filters in- between the 1.25″ and 2″ barrels. This is particularly convenient for users of 2″ filters. 6mm, 8mm, 12mm, 16mm, 24mm and 32mm in a wooden case!